Braces are synonymous with helping people to achieve a picture-perfect smile, but their benefits go beyond aesthetics. By straightening the teeth, they help patients to bite, speak, and chew more effectively. Did you know that straighter teeth are also easier to brush and floss? All of these benefits add-up to healthier teeth and gums! At Woonona Dental, our options we give are made to suit every individual’s mouth, aesthetic choices, and budget. During your initial consultation, our dentists will answer any questions you have about selecting the perfect treatment for you and in more complex cases where smile fast braces or clear aligners are not suitable we will refer you to a specialist orthodontist to look after your treatment. Smilefast is designed exclusively for adult patients who want straighten teeth without spending 2-3 years in metal braces or clear aligners. 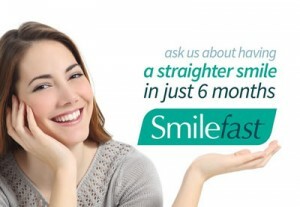 Using discreet clear braces, Smilefast can quickly, yet safely, give you the beautiful straight teeth you always wanted. Smilefast is also a more affordable option due to the reduced treatment time and fewer visits. Smilefast can treat a wide range of orthodontic cases that many other treatments cannot. This includes but is not limited to: Crowding, lower crowding, spacing, protrusion and under bite. The incredible speed and quality of smilefast treatment is largely due to revolutionary Smilefast technology. Unlike traditional orthodontics which relies on plaster models, Smilefast provides us with a detailed 3D digital model of your teeth. This model identifies the precise postion to place each bracket on your teeth, which is the most important aspect to obtain rapid tooth movement. With this technology your dentist can rapidly yet safely, straighten your teeth far sooner than with traditional orthodontics. Clear aligners are effective for some patients, however they often cannot treat more difficult cases, have much longer treatment time and results are not as predictable as with fixed braces like smilefast. Smilefast is the ideal alternative and many patients agree. Why? The reasons are simple – with smilefast you get a better result in a much faster time that also costs you less. For more information visit www.smilefast.com.au or contact Woonona Dental to schedule your appointment!